The most common rat in North America is the Norway rat. If you notice evidence of a rat infestation in your Austin home, call the pest control professionals at Magic Pest and Lawn for the most effective Norway rat control in Austin. Norway rats are commonly known by many different names, such as the brown rat, gray rat, Norwegian rat, sewer rat, wharf rat, house rat, street rat or, simply enough, the common rat. No matter what you call this pesky brown rat, Norway rat infestations can be a major problem for your Austin household. 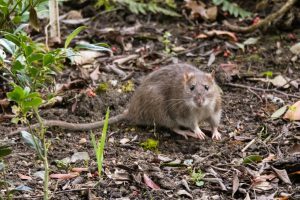 These common rats may not seem large and imposing, but the structural damage and health risks rats can inflict on your Austin property can be massive if professional Norway rat control is not performed at the first signs of a Norwegian rat / brown rat infestation. What Do Norwegian Rats Look Like? Norway rats are also called the brown rat or gray rat because they are easily identified by their coarse grayish- brown fur. Norwegian rats have a thick, large body, relatively small, hairless ears, and protruding eyes. A Norway / sewer rat’s tail also is furless with a scaly texture. Norway Rat Size: As one of the largest rat species, the sewer rat can be 6-8 inches in length (excluding tail) and weigh up to an entire pound. Norway Rat Habitat: Norway rats create burrowed tunnels through soil, basement areas, building foundation cracks, cracks in woodwork, basement areas, garages, crawlspaces, and sheds. They also create nests in Austin homes that consist of accumulated debris, such as bits of paper, cloth, and fibrous material. The common brown rat enjoys grains, meat, seeds, fruit, and other insects, and tends to live close to a central water source and food sources, such as open garbage cans or unsealed food bags/ containers in pantries. Rat droppings: Norway rat droppings are ¾ inches, capsule-shaped with blunt ends, and found in small piles. Rat droppings in your home are the most common and obvious sign of a house rat infestation and indicate that you should call your rodent and rat control professionals at Magic Pest to prevent Norway rat problems from getting out of hand! Scratching in walls: If you are hearing strange scratching or scraping noises in your walls, particularly at night, you might have house rats. Norway rats are nocturnal and like to forage for food in the dark hours, making them active and noisy in the evenings. Small teeth marks or scratches: If you notice scratches or bite marks on woodwork and baseboards; holes or chewed areas in your cardboard food containers or bags of seed and pet food; or tiny footprints and greasy trail marks around your walls and in dusty areas, it might be signs you need to call the Norway rat control experts at Magic Pest and Lawn. Norwegian rats multiply quickly. A typical brown rat litter can be between 4-22 babies, and female brown rats can give birth up to 12 times per year. If you don’t get professional Norway rat control as soon as possible, you could be going up against an overwhelming amount of these nasty sewer rats. Even waiting one week to get rid of Norwegian rats can be the difference between an easy rat control solution and hundreds of dollars in damage to your home’s interior, exterior, and personal belongings. Contact Magic Pest and Lawn’s rodent control professionals in Austin to eradicate your rat infestations with cutting-edge, safe Norway rat control today!